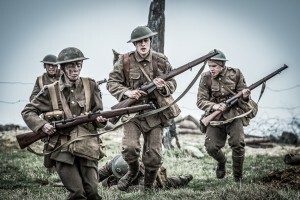 Marking the centenary of World War One, Our World War is a new BBC Three drama series documenting the real experiences of young British soldiers who bravely fought in the war. The three part drama draws on stories of World War One soldiers and aims to bring audiences closer than ever before to the real events. The Our World War production team visited The Historic Dockyard Chatham where they filmed exterior street scenes before and after a shell explosion and The Ropery doubled as a forward command post. The Historic Dockyard Chatham is a fantastic film location due to its mix of cobbled streets, industrial buildings and impressive Georgian and Victorian architecture. Feature films Les Miserables (2012) and Sherlock Holmes (2009 and 2011) as well as TV dramas Call the Midwife (2012-2014) and Oliver Twist (2007) have also chosen to film at this diverse Kent location. Our World War starts on Thursday 7th August 2014 on BBC Three at 21:00. This entry was posted in Filmed in Kent and tagged Our World War film locations, The Historic Dockyard Chatham, TV Drama. Bookmark the permalink.